The EU found that the two companies had identical milk, meat that was “similar to a high degree” and similar seasonings. 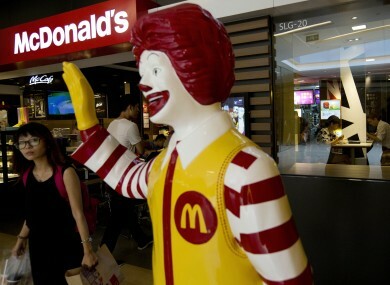 IRISH FAST FOOD brand Supermac’s has been dealt a blow in its European case against McDonald’s. The US company, which operates about 34,000 outlets across the world, had filed a 41-page complaint with the EU’s Office for Harmonisation in the Internal Market (OHIM) about Supermac’s pending bid for a Europe-wide trademark. In its decision, OHIM has partially upheld McDonald’s claim, rejecting Supermac’s trademark application for a number of items including food and drink services. While Supermac’s was awarded its own trademark in Europe, it lost the part of the case which allowed it to sell its core products – including toys, food, drinks, coffee, ice-cream and meat. McDonald’s had argued that there was a “likelihood of confusion” if Supermac’s was allowed a trademark in Europe, saying it had trademarked McFish, McToast, McCountry and other derivations of Mc. It found that the two companies had identical milk, meat that was “similar to a high degree” and similar seasonings. It added that confectionary items, hamburgers, ice-creams, condiments and coffee were identical. The two companies had signs that were considered similar, with McDonald’s Big Mac and Supermac’s deemed too close. “To the extent that both marks contain the element ‘MAC’, which may be perceived as a name or a nickname, the marks are conceptually similar. Furthermore, to the extent that both marks may be perceived as containing references to great or considerable size, they are also conceptually similar in that they refer to quantitative indicators. OHIM said that consumers may be confused as to whether Supermac’s is a new version of McDonald’s. Supermac’s Managing Director Pat McDonagh told Newstalk Breakfast this morning that “the battle is not over” and the company would not stop fighting to open their restaurants in Europe. He pointed out that Supermac’s would pay more tax to EU countries than a large multi-national and said that the tax spend saved by McDonald’s was “used for better advertising” and allowed them to “compete on a whole different level”. In a statement today, the company said it was happy to have been awarded a European trademark. This is another positive step forward for Supermac’s with our international expansion plans. We are confident that ultimately common sense will prevail on the part of the decision makers. Email “Supermac's has been dealt a blow in its fight against McDonald's”. Feedback on “Supermac's has been dealt a blow in its fight against McDonald's”.